It’s hard to believe that it’s that time of year again to be sharing holiday gifts! But here we are, and here you are, so let’s chat all things gift giving (because who doesn’t love to brighten someone’s day with the perfect gift, amiright?!). We know there are approximately one billion gift guides out there, so we’re not sharing a guide as much as we’re sharing gifts we love. 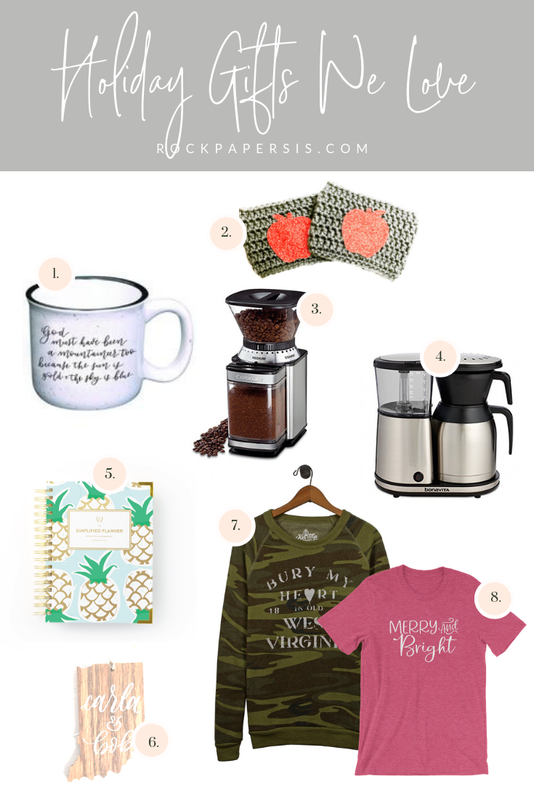 This season’s gift list is brought to you by *most* things small business (with some Amazon favorites in between) and a healthy dose of Schitt’s Creek (because that’s what we’ve been watching while we work for the last several weeks! If you’re not watching it, get to Netflix NOW!). Home Brewed and Company Mugs - These mugs are the best! Our friends at Home Brewed spare no expense when it comes to quality and style. They produce the most amazing prints and hand calligraphed materials, and they’re two of the most genuine people you’ll ever meet. Grab one of their mugs for everyone on your list and be sure to pick up one for yourself. Jilli’s Beanies - We love supporting local, and it doesn’t get more local than our best friend from preschool! This girl is self taught in crochet, and she makes the most incredible hats, scarves, blankets and more. Be sure to check her out and pick up one of her incredibly handcrafted pieces! CuisinArt Coffee Bean Grinder - Ditch the plastic in 2019! Getting away from KCups was one of the best decisions we made this year, and the coffee tastes so much better when you grind it fresh! We highly recommend this grinder - it’s quick, easy and we promise, you won’t miss the KCups. Pair with some Concord Coffee (use code ROCKPAPERSIS at checkout), and you won’t be sorry! BonaVita Coffee Brewer - Good coffee needs a good brewer! We’ve had great success with this brewer, and much like the grinder, it’s so quick and easy to use. Grab some Melitta #4 filters, and you’re all set. This is the absolute best way to enjoy your daily brew - you can thank us later! Emily Ley Simplified Planners - You know we’re huge paper fans! While we love a lot of different planners and journals, the Emily Ley Simplified Planner is our go to! This planner will help you get in the best mindset for 2019 with it’s beautifully simple design and layout. On top of that, she’s added some simplified prep work and steps to help you set your best intentions for the coming year. We can’t recommend this planner enough! Pair it with the Pilot Precise V5 pen for the perfect duo. MarisaMade Christmas Ornament - Although time is running out to get something new on your tree, we can’t say enough amazing things about our friend Marisa and her beautifully calligraphed Christmas ornaments. These ornaments are a collaboration with Bear Wood Company, and what’s better than supporting two small businesses with one gift?! We promise, you’ll love everything about these beautiful ornaments, and so will your recipients! Kin Ship Goods Sweatshirts - Seriously guys, listen. These sweatshirts are straight out of Heaven. We could absolutely live in these bad boys, and we would be lying if we said that was partially true (this camo WV sweatshirt is one of our faves!). Go grab one or 10 of these for everyone on your list! Rock Paper Sisters Tees - Last, but not least, we would be remiss if we didn’t advise you to grab one of our custom designed tees for all your gift recipients this season! The Merry & Bright tee has been a fan favorite, and we’re personally obsessed with the Farm Fresh Christmas Trees design. No matter which one you choose, you can’t go wrong! We could go on and on about the gifts we love, but you’re busy, we’re busy, and we all need to finish that last minute shopping! If you can, shop small this season. The local artisans and small businesses that you support with your shopping dollars truly appreciate your purchase more than you’ll ever know! Yes, Amazon and Target are easy and convenient, but a real person does a happy dance or sends their kid to college or pays the electric bill with your purchase - so that’s pretty cool. No matter what you do this season, remember the reason we celebrate. Christmas is a time to pause and reflect on our Savior, and that’s the greatest gift of all! *This post may contain links to affiliate pages. For more information on our affiliate programs, please visit our Privacy and Disclosure Page.